UDM Downloads > Easy Way to Create eBooks using C++! 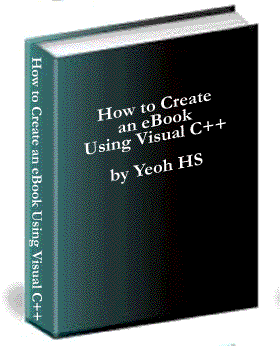 Would you like to know how, step-by-step, to create your own eBook using Visual C++? Would you like to know how to write a real world Visual C++ application: from initial concept to implementation? Are you looking for a way to create your own executable eBooks without having to buy a commercial eBook compiler? Do you want full control over the way your eBook function and look? Are you having trouble finding an eBook compiler that suits your unique needs? Why not create your own executable eBook that fulfills all your needs? If you answered "Yes" then download this sample eBook to see what it can do for you.